In medieval times, a bestiary was an illustrated compendium of monsters, often accompanied by moral lessons. This document is Heavy Reading's attempt at a bestiary for operations support systems (OSS) and business support systems (BSS). Contrary to popular opinion, OSS and BSS do not date back to the Middle Ages. The use of computer systems to replace manual processes in telecom management dates back only to the 1970s. Many of these systems (e.g., TIRKS) are still in use today, and this may give the impression that OSS is ossified. However, we can confirm that OSS and BSS are alive and well – though sometimes they prefer to be known as "orchestration" and "monetization." how M&A activity has evolved over the last 12 years. The report also briefly profiles 19 vendors that we selected either because of their size (big), their transparency (public companies), or simply because they caught our fancy. The B/OSS market is likely to undergo significant change in the coming years, driven by the move to network virtualization and, more broadly, by the transformation of CSPs into digital service providers. Whether these forces lead to a consolidation around a handful of full-suite providers or a proliferation of best-of-breed vendors remains to be seen. However, modernization of B/OSS will be key to the automation of network and customer operations, as well as the increase in openness and agility that CSPs need to compete as we approach the 2020s. We have undertaken a bottom-up analysis of the size of the B/OSS market based on revenue disclosures and estimates of the top 50 vendors. We have excluded consulting and outsourcing firms such as Accenture, Aricent, Atos, Cognizant, HCL, and Tata Consultancy. Although some of these firms do have B/OSS products, we believe they mostly sell professional services. Furthermore, few of these companies disclose how much of their revenue is telecom-related, and none of them specify what proportion is B/OSS-related. Based on our estimates, we derive a total B/OSS market value of around $17 billion. 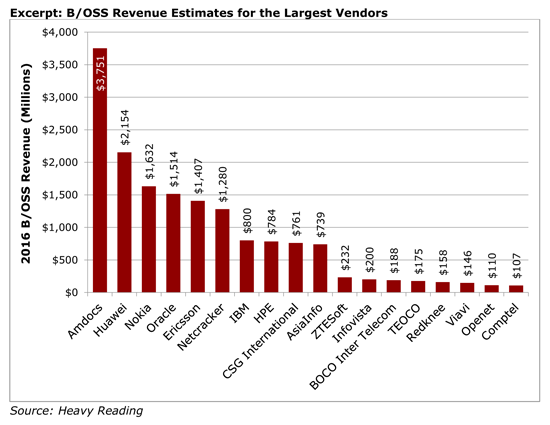 The excerpt below shows our 2016 B/OSS revenue estimates for all vendors over $100 million. This corresponds to 18 out of the total universe of 50 vendors that we considered. The top five vendors have a collective share of 61 percent of our total market estimate of $17 billion. The other 13 vendors with revenue more than $100 million comprise a further 32 percent share. The remaining 32 vendors make up the other 7 percent share. OSS/BSS Vendor Landscape: Industry Outlook & Company Analysis is published in PDF format.